.. cemetery was inspected by Marty Van Lith. He reports: "The Corwin Cemetery is very overgrown, probably hasn't been maintained in several years. Eliza Corwin's stone is the only one that is broken. Given the simple and very worn sandstone headstone for Revolutionary War Richard Corwin I think the Feds should spring for one of their monuments." .. at southwest corner. In foreground are (right to left) are stones 9, 10 and 11. The Corwin Family Cemetery is located south of 10 Beaverbrook Dr., about 190 feet from the roadway. It is a trapazoidal plot approximately 26 feet north-south by 39-52 feet east-west. While there is a right-of-way to the site from Chapel Avenue, it is not maintained. The site is now surrounded by private residences. Throughout most of the 19th century into the 20th century, this area, from South Country Road eastward to Little Neck Run, and from about the present Long Island Rail Road right-of-way southward to about modern Chapel Ave., was the Corwin family farms, containing several family residences and farmsteads. The cemetery grounds are in good condition. In 2010 the Fire Place Hiustory Club sponsored a restoration project using Caithness Community Benefit funds. One badly dameaged stone was repaired and several stone reset. The site is now receiving some maintenance from the Town of Brookhaven. The surrounding low chain link fence is in need of some minor repairs. The gravestones are in fair to good condition. All stones are readable, although a few evidence deterioration. There are two stones present which were not recorded on the c. 1939 Town of Brookhaven Historian's Cemetery listing -- Nathaniel H. Corwin and Fannie A. Corwin -- likely because their deaths occurred after the Town survey "cut-off" date of 1881. This cemetery has Historic Sites Ref. ID Br05B.1-S and is #33 on the Town of Brookhaven Historian's Cemetery List. His gravestone has not been found. 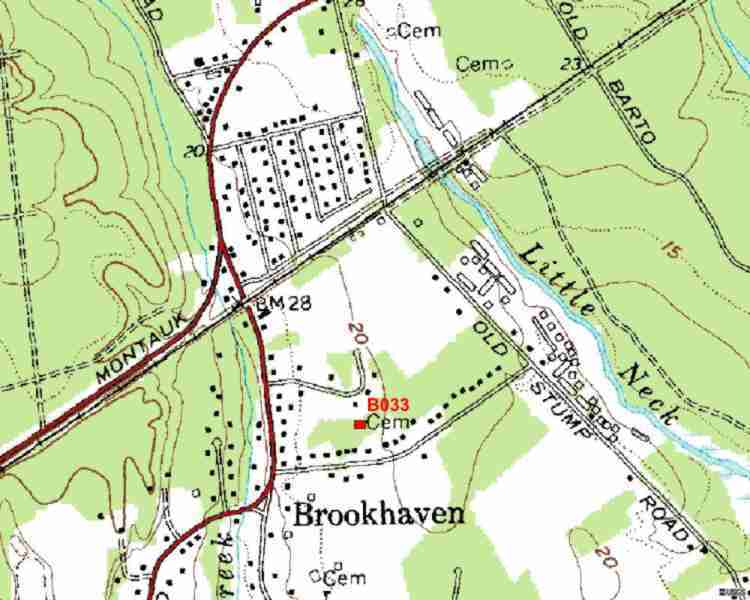 The Town of Brookhaven Historian's cemetery inventory (c. 1939) recorded his gravestone as being in the Corwin Family Cemetery (B033), but it is missing from this cemetery. In 1975, his gravestone was recorded as being in the Nathaniel Hawkins Cemetery (B039) (see B. Kress documentation). When gravestone #33.07 is excavated, it may be discovered to be his, or perhaps another still buried stone nearby. While their are some family connections, there is no obvious reason for the gravestone being moved sometime between 1939 and 1975 -- except perhaps that of pranksters.